Sun, sea, sand and bus rides - what more could you ask for? Runs during summer. Dates to be confirmed. Runs during school summer holidays. Dates to be confirmed. 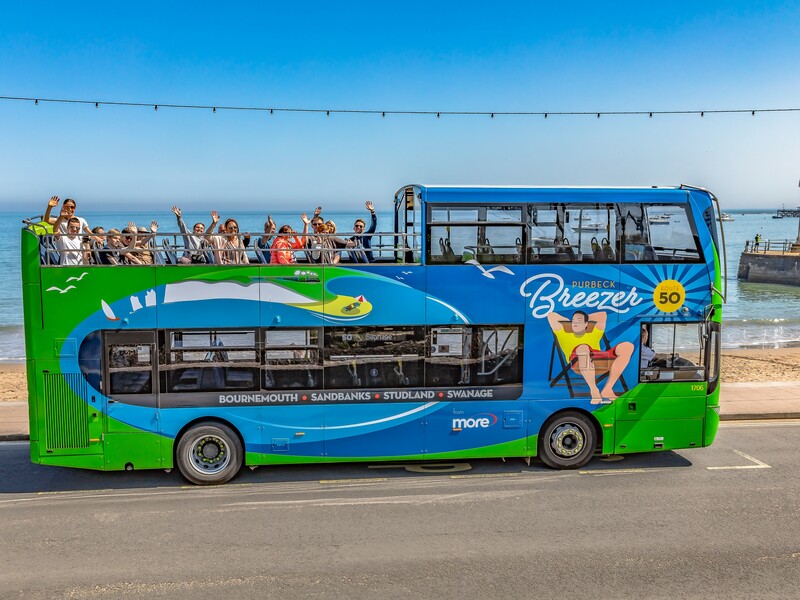 The Purbeck Breezer routes are part of the morebus network and the tickets can be used interchangeably. The network is split into zones with Zone A including most of Poole, Bournemouth, Sandbanks and Christchurch. Zone ABC covers all of Swanage, Wareham, Studland, Weymouth and beyond. Singles and returns are available, but with a dayrider, you can hop on and off all day long! You can even get a group dayrider for up to five people travelling together to save you money on your travel. If you're a frequent traveller, you can take advantage of our period passes with weekly, monthly, three-monthly and annual tickets available. We accept cash, contactless debit/credit card, Apple Pay, Android Pay, theKey and Clickit2ride mobile app on all of our buses. You can now buy your tickets using our mobile app, Clickit2ride. Just buy your ticket, scan it on-board and go!